Summer is a time of outdoor activity for all the residents of our pet-friendly Springs Apartments homes. Don't forget that Fido and Whiskers need protection from the sun just like you do. 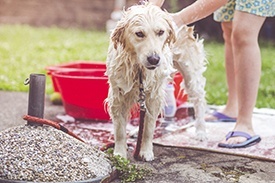 Here are some valuable tips to keep your precious pets safe and happy during fun in the sun. Walk your dog in the morning or evening when temperatures are cooler. Avoid the period between 1 p.m. and 4 p.m., which is usually the time of the highest heat and humidity. Did you know that skin cancer is the most common form of the disease in dogs and second most common in cats? Apply pet sunscreen to sensitive areas, such as bellies on dogs and ears and around eyes on cats, that are not protected by fur. Be sure you use a sunscreen without zinc oxide, which is toxic to dogs and cats. If your pet does get burned, consult your vet for recommendations of safe aloe vera products and apply a thin layer twice daily. It may seem intuitive to cool your pet off with a stylish brush cut, but his coat actually helps to control his body temperature. Groom your pet regularly, either professionally or by yourself, to keep hair from getting matted. By now you have heard countless stories of the tragic results that occur when pets are left in cars. Do not, under any circumstances, leave your pet in a locked car. It's better to leave your dog or cat at home for a while rather than risk losing him permanently. When you take your dog outside, make sure you stick to areas where shaded spots are available and bring water along. You should also check your pet's water dish more frequently. Try these easy DIY "pupsicles" and "catsicles" for a refreshing treat. Don't assume your dog can swim. Use a doggie life jacket in a bright color to keep him afloat and visible to other swimmers and boaters. You should also be on the lookout for currents and riptides that can sweep your dog away, regardless of life jackets or swimming skills. Immediately move your pet to a shaded area. Apply ice packs or damp towels to his head, neck and chest. Give him small amounts of drinking water. Take your pet directly to the vet for emergency treatment. Our Springs communities have on-site leash-free dog parks where you and your pet can have fun socializing with other dogs and their "humans." Enjoy a happy and healthy summer with your furry friends!